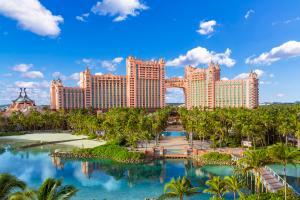 Located on Paradise Island, approximately 13 miles from Nassau Airport. Bahamian Club - Gourmet steak and seafood; Nobu - Sushi and sashimi; Bimini Road - Colorful Caribbean specialties. Casinos, Snorkelling Lagoon, Water Park, Marine Exhibits, Golf, Mandara Spa.